Playspace clown training has a physical and emotional focus, and encourages a theatrical and irreverent approach to the art form. Graduating students are now working professionally in many places in the world. We tend to think of clown as the painted faced character which has come down to us from the circus tradition of the last two hundred years. However clown is possibly the oldest art form, occurring in every society throughout the ages, and it is an art form which has been undergoing a renaissance and a rejuvenation over the past few years and spawning physical theatre. Modern clown is less character based and more interactive than traditional clown, it is less about hiding behind make-up and more about revealing our true selves, and less about routine based entertainment and more about spontaneous artistic expression. Reconnect with the playful, inquisitive, cheeky, clown spirit in a centrally heated studio space with adjoining dormitory accommodation, overlooking the mouth of the Wanganui river. 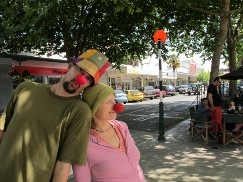 This workshop led by Alan Clay (pictured right with students from the 2011 Clown Retreat) is proving very popular at his retreat centre in New Zealand. Each day will start with a yoga warm up and participants will work physically to free themselves from patterns and to connect with their emotions. Street theatre has informed and assisted the development of modern clown, and participants will take exercises from the studio and work at street-cafe's to develop interactive audience skills. It's easy and fun. "Alan's workshops are consistently described as challenging but fun. Alan keeps you on the edge of the unknown in his teaching work, so you are always comfortable, but always discovering new things. As the work progresses, this process leads to a sense of freedom which produces better and better performing work." 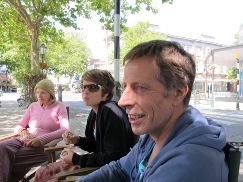 Playspace Studio, directed by Alan Clay, was first established in Auckland, New Zealand in 1983, and re-established in Sydney, Australia, in 1998, where for the next 7 years he taught year long clown courses. 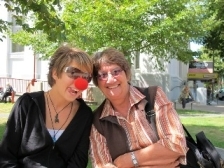 Following this, for several years Alan toured a 5 day workshop throughout Australia and North America and for the past 4 years he has been teaching 5 day residential clown retreats in Wanganui, New Zealand. 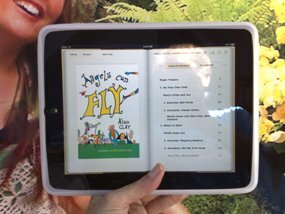 Alan Clay's book, Angel's Can Fly, a Modern Clown User Guide, has been released as an eBook for the Apple iPad, which can be purchased through the iBooks app at iTunes. Angels Can Fly is also available in paperback which can be purchased from Amazon. Add your e-mail address to our mailing list below, to receive monthly information on the classes at Playspace, and the growing physical theatre community worldwide. Check out an archive of issues from 2002 - 2010 on our Physical News page. Check out the Artmedia main page for other similar activities. Artmedia Publishing specialise in promoting contemporary Australian and New Zealand Literary & Performing Arts. Artmedia links offers links to electronic publishing and writing resources, in Australia, New Zealand and worldwide. This site published by Artmedia Publishing The content of this site is copyright, and no part may be reproduced or transmitted for commercial purposes, without the prior permission in writing from the publishers. Artmedia is building a community of interest in contemporary Australian and New Zealand literary and performing arts - Click on this link to find other similar sites.